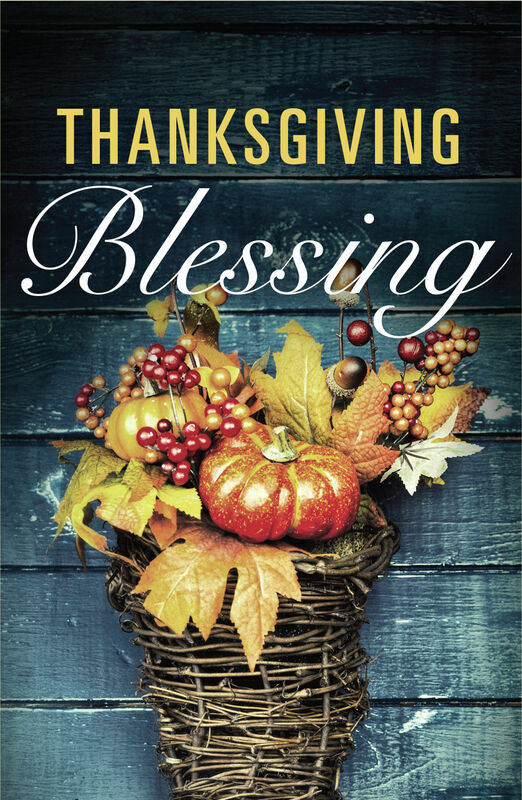 This tract gives blessings, Scriptures, and thoughts to share with family and friends during the Thanksgiving season to thank God for all his goodness. THANKSGIVING. IT’S A SPECIAL TIME TO GATHER WITH FAMILY AND FRIENDS, SHARE A DELICIOUS MEAL, WATCH PARADES AND FOOTBALL, AND TAKE AN AFTERNOON NAP. Thanksgiving is also the perfect time to acknowledge God’s presence in our lives and thank him for the countless blessings he gives us. As you share the Thanksgiving holiday with those around you this year, take a few moments to focus on God by sharing these thoughts, scriptures, and blessings. They will enrich your time together. Rejoice in the Lord always; again I will say, rejoice. Let your reasonableness be known to everyone. The Lord is at hand; do not be anxious about anything, but in everything, by prayer and supplication with thanksgiving let your requests be made known to God. And the peace of God, which surpasses all understanding, will guard your hearts and your minds in Christ Jesus. Thanksgiving is not just about being thankful. It’s important to remember to be thankful to God for sending his Son, Jesus Christ. Of all the things God has provided and all the things in the world to be thankful for, the greatest is his gift of salvation and eternal life. The Bible says that “all have sinned and fall short of the glory of God” and that “the wages of sin is death, but the free gift of God is eternal life in Christ Jesus our Lord” (Romans 3:23; 6:23). Each one of us is destined to eternal separation from God as punishment for our sins. But God provided a way to reconcile sinners to himself— by sending his Son, the Lord Jesus Christ, to die on the cross in our place, as our substitute, so that we can have eternal life. “God so loved the world, that he gave his only Son, that whoever believes in him should not perish but have eternal life” (John 3:16). Then God raised Jesus back to life three days after his crucifixion, proving that our punishment was paid in full. “Who is to condemn? Christ Jesus is the one who died—more than that, who was raised—who is at the right hand of God” (Romans 8:34). But like any gift, you have to accept it, or it’s not yours. Believe that God’s gift of salvation is for you! The Bible says: “If you confess with your mouth that Jesus is Lord and believe in your heart that God raised him from the dead, you will be saved” (Romans 10:9). Dear God, I know I am separated from you because of my sins. I ask for your forgiveness. Thank you for sending your only Son, Jesus Christ, to die on the cross and rise from the dead to completely take away the eternal consequences of my sins. I now trust in him alone as my Savior. Thank you for your free gift of salvation and eternal life.